Complete Vitamins Plus. 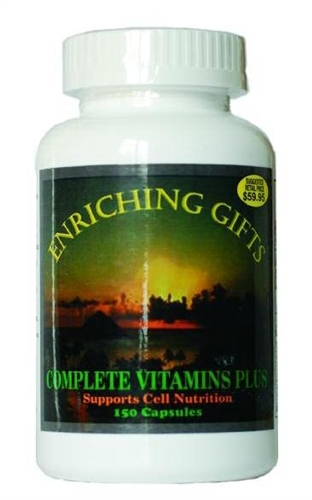 A comprehensive vitamin, mineral, nutrient, amino acid, antioxidant and anti-aging formula which meets and exceeds 100% of all RDA recommended vitamins, minerals nutrients etc. from one source. Formulated to counteract your exposure to oxidants and oxidative stress, Complete Vitamins-Plus is a comprehensive vitamin, mineral, nutrient, amino acid, antioxidant and anti-aging formula. Formulated to counteract your exposure to oxidants and oxidative stress, Complete Vitamins-Plus is a comprehensive vitamin, mineral, nutrient, amino acid, antioxidant and anti-aging formula. It meets and exceeds 100% of all RDA recommended vitamins, minerals nutrients etc. from one source. Most nutrients in Complete Vitamins Plus are derived from whole plant foods. These ingredients are Standardized raw material ingredients, double tested and analyzed for purity, potency and toxicity through independent testing to meet and exceed the highest potency and purity that we demand from our products. Contains vital nutrients for additional nutritional support.